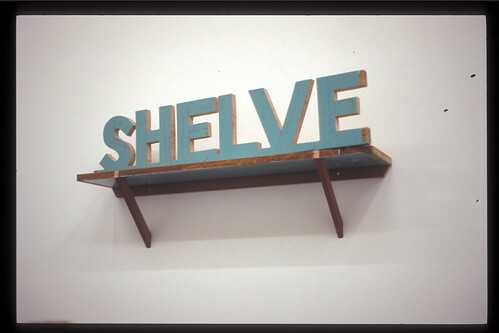 SHELVE, 1997, hand-cut wood mounted high on the wall. 1997: exhibited at 151 Regent Street Gallery, Chippendale, Sydney (directors Rohan Stanley & Bec Neill) as part of in “Working Together” exhibition with Tim Hilton, Erna Lilja, Michelle Seamons, Nathan Waters. 2006: exhibited in “artlanguage: every publishable place” curated by Ruark Lewis, Cross Arts Projects (director Jo Holder). 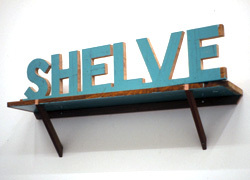 2010: SHELVE is exhibited at the Delmar Gallery in the exhibition Shelf Life, curated by Catherine Benz. Before being exhibited, SHELVE undergoes small repairs. There is an interview about this work here. Some more pictures of SHELVE can be found here.